Hey y'all! Today's post is one that I feel like I've written over and over in my head but I haven't actually typed it into words. Last week, I was shopping online for a long sleeve little black dress for fall and winter, I stumbled across the dress below. Without much thinking, I ordered it because I knew I could easily return it if it didn't work out for me. I knew it was a form fitting dress but I sized up one size thinking it wouldn't be too snug on me. I mean, I usually purchase the color black to hide my "flaws" so I was hoping the bigger size would make this dress work. If I am being super honest, I did not like the way I looked when I first put this dress on. Even with the generous ruching detail to help camouflage my mom tummy, I still didn't like the way my stomach looked and I thought my backside looked too big. My husband insisted that I looked fantastic but the unrealistic desire for perfection made me want to put this dress back in the package and return it to Nordstrom as soon as possible. That night, after I tried on the dress, I was still thinking about the destructive thoughts I was having while I was trying it on. They were nothing but negative and I was so frustrated with myself for shaming my body. I want to love my body, just as it is, so that I can encourage other women to love theirs as well. That's why I am finally typing out this post instead of letting it sit in the back of my mind. Just let those powerful words sink in. You are fearfully and wonderfully made. There's so many reasons for us feeling less than confident in our own skin. For myself, it's comparison to others. 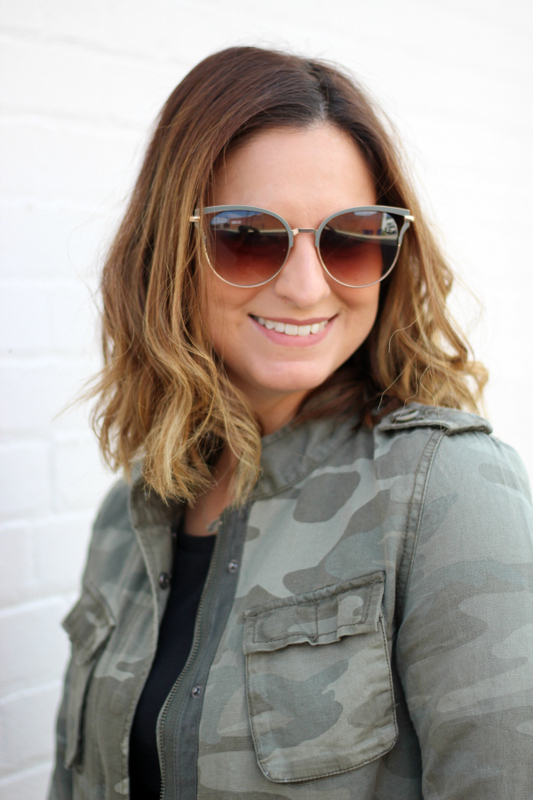 As a blogger, the temptation to compare myself to other bloggers (and other women in general) is ever present. Sometimes I feel like there's so much pressure to look "perfect" and to hide the flaws. But we are all imperfect. We are all human! Another big reason for not feeling confident is negativity. Those negative thoughts I was having about the way my body looked in a dress were hurting me emotionally. Instead of focusing on what's "wrong" with your body, focus on what you love about your body. Every time you have a negative thought try to suppress it with at least three positive thoughts. This is the positivity ratio. It's important to overcome these negative thoughts and learn to love the body we have. As a mother to two little girls, it's so important to me that they never hear me finding flaws in myself. I want to model confidence and self-love because I know they are listening to my words and watching my every move (even when I don't think they are). I want my daughters to know that true beauty comes from within. Their worth is never to be found in the way they look in a pair of jeans or the number they see on a scale. Teaching our daughters to love their bodies starts with them seeing us mothers love ours, just as they imperfectly are. And P.S. when I stopped my negative thoughts about this dress, I really started to love the way I looked in it! I felt so confident strutting my stuff down the streets of my small town. This post really isn't about the dress because it's about so much more than just a dress. However, you will see me styling this dress again because it sparked a desire in me to love myself just the way that I am and encourage you to do the same. Show off your curves, embrace your round bottom, and know that you are absolutely beautiful, just the way you are! 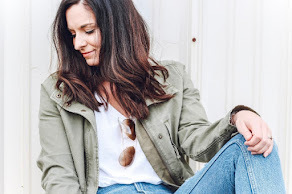 Thank you so much for stopping by today and a big thanks to my sweet friend, Emily Martin, for your input on this post! I hope y'all found it to be of encouragement. Have a great day! You look amazing in this dress Emily! You inspired me to buy a similar dress! I have such a bad habit of comparing myself to others but it's something I'm working on. Love your outfit too btw! Amazing outfit, so stylish and I love the way you put this look together :) thanks for sharing! Love you and your little black dress!! I am loving this outfit! 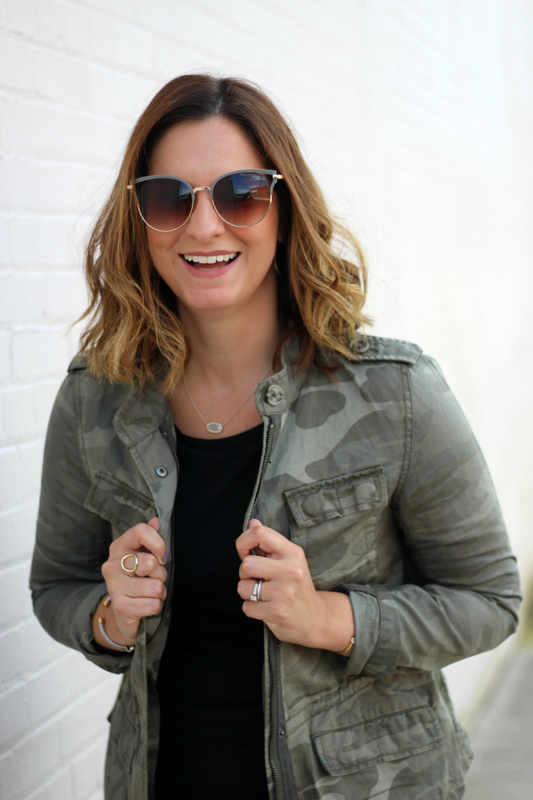 It's perfect for Fall and such a great way to dress down a LBD! 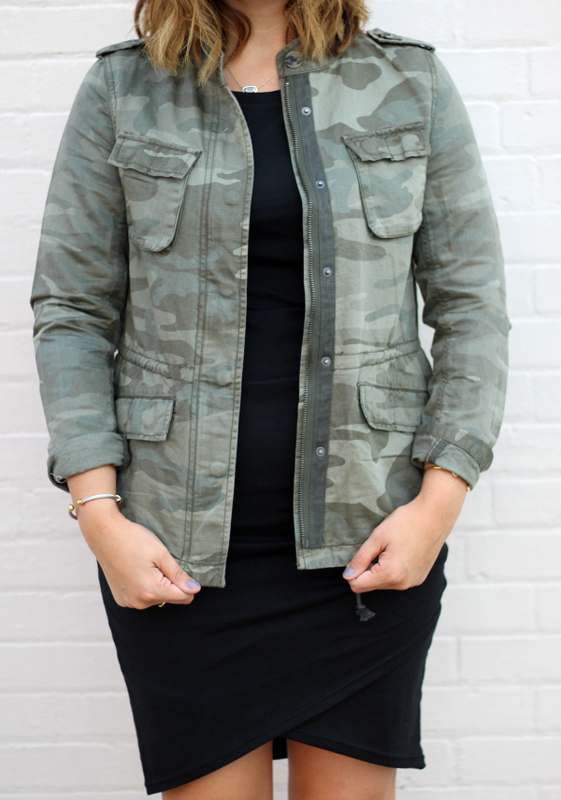 This camo jacket can definitely be a staple too! Loving that it's from the Loft which is reasonably priced and can be kept for multiple years! Great post! Thanks for the encouragement! You look great! You styled it perfectly! I love the jacket! You look amazing! I like that dress!! It's so simple and you can do anything with it. I too am trying to change my vocabulary about my body. I am plus size, fat, over weight whatever you want to call it, and there is a good chance that my daughter will be above the "normal" size that woman are told they should be. I don't want her to go through what I went through growing up. Every day I strive to tell her she is beautiful. I never want her to feel that she isn't. As women we are so hard on ourselves. So thank you for the beautiful reminder that we need to be kinder to and love our ourselves. Btw, your hubby was right you look incredible! First of all, from what I can see you look amazing in the dress. Second, thanks for that verse- we tend to forget that sometimes. Third- the comparison game is so real; all of us are likely guilty of it to some extent. It is so tempting to look at the next blogger with the super long legs, or that one over there with all the followers, etc. It takes a lot of work to step back and focus on the fact that we all have different paths. Thanks for your candid thoughts, and celebrate your body; it looks amazing AND it birthed two humans! We are our own harshest critic! I'm so glad you kept the dress and have people around you who encourage and affirm you when insecurities come up. You look fabulous! I used to do this thing with friends, that for every negative comment we'd say about ourselves we'd then have to say five things we liked about ourselves. Beautifully said ! Honestly you look so good in that dress. Thanks for sharing your inspirational story. Great Post! Love the dress & this is one of my favorite bible verses. It is so important to remember that God designed each of us with His gracious love.